A top super PAC aligned with presumptive Democratic presidential nominee Hillary Clinton just dropped another brutal ad aimed at Donald Trump’s apparent mockery of a disabled reporter. 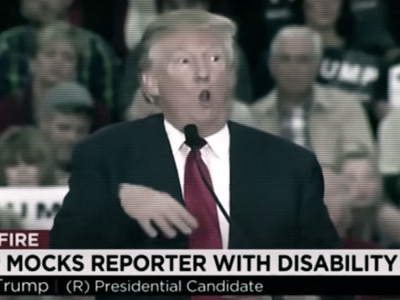 At a November rally, the presumptive Republican presidential nominee impersonated New York Times reporter Serge Kovaleski, who has a disability that limits his arm movements. In the pro-Clinton group’s 60-second television ad released Monday, the parents of a daughter with spina bifida criticised Trump for appearing to mock the reporter’s disability. “When I saw Donald Trump mock a disabled reporter I was shocked,” said Lauren Garlos, whose daughter, Grace, is featured in the ad. For his part, Trump has maintained that he was not mocking the reporter’s disability, but rather attempting to characterise Kovaleski’s retraction of an article that Trump was using at the time to prove that Muslims celebrated in New Jersey following the September 11, 2001 attacks. “Despite having one of the all-time great memories I certainly do not remember him,” the Republican front-runner declared of Kovaleski in a statement in November. According to Priorities USA, the ad is part of a $20 million buy set to hit the airwaves in swing states such as Ohio, Virginia, Florida, New Hampshire, Iowa, Colorado, and Nevada. Priorities USA plans to spend a reported $130 million on a television ad campaign designed to help turn out female, black, and Latino voters, many of whom have been alienated by Trump’s inflammatory rhetoric. But while the super PAC will spend millions carpeting the television airwaves with anti-Trump ads, the videos are also designed with a shareable online message in mind. A previous ad released by the super PAC last month, titled “Speak,” showed people reading some of Trump’s inflammatory statements about women. That racked up over 500,000 views on YouTube. As of Tuesday, “Grace” had over 75,000 views on YouTube.